"It" is the golden ratio, a geometric proportion that has been theorized to be the most aesthetically pleasing to the eye and has been the root of countless mysteries over the centuries. Now, a Duke University engineer has found it to be a compelling springboard to unify vision, thought and movement under a single law of nature's design. Also know the divine proportion, the golden ratio describes a rectangle with a length roughly one and a half times its width. Many artists and architects have fashioned their works around this proportion. For example, the Parthenon in Athens and Leonardo da Vinci's painting Mona Lisa are commonly cited examples of the ratio. 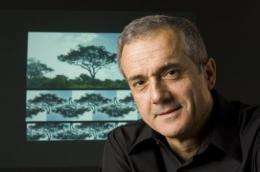 Adrian Bejan, professor of mechanical engineering at Duke's Pratt School of Engineering, thinks he knows why the golden ratio pops up everywhere: the eyes scan an image the fastest when it is shaped as a golden-ratio rectangle. The natural design that connects vision and cognition is a theory that flowing systems -- from airways in the lungs to the formation of river deltas -- evolve in time so that they flow more and more easily. Bejan termed this the constructal law in 1996, and its latest application appears early online in the International Journal of Design & Nature and Ecodynamics. "When you look atwhat so many people have been drawing and building, you see these proportions everywhere," Bejan said. "It is well known that the eyes take in information more efficiently when they scan side-to-side, as opposed to up and down." Bejan argues that the world - whether it is a human looking at a painting or a gazelle on the open plain scanning the horizon - is basically oriented on the horizontal. For the gazelle, danger primarily comes from the sides or from behind, not from above or below, so their scope of vision evolved to go side-to-side. As vision developed, he argues, the animals got "smarter" by seeing better and moving faster and more safely. "As animals developed organs for vision, they minimized the danger from ahead and the sides," Bejan said. "This has made the overall flow of animals on earth safer and more efficient. The flow of animal mass develops for itself flow channels that are efficient and conducive to survival - straighter, with fewer obstacles and predators." "Cognition is the name of the constructal evolution of the brain's architecture, every minute and every moment," Bejan said. "This is the phenomenon of thinking, knowing, and then thinking again more efficiently. Getting smarter is the constructal law in action." While the golden ratio provided a conceptual entryway into this view of nature's design, Bejan sees something even broader. "It is the oneness of vision, cognition and locomotion as the design of the movement of all animals on earth," he said. "The phenomenon of the golden ratio contributes to this understanding the idea that pattern and diversity coexist as integral and necessary features of the evolutionary design of nature." From the title one could assume that this article discusses the reasons for appeal of golden ratio, but omits this information completely. There is much talk aboult perceptions and cognitions, but the actual idea that how golden ration fits into this picture, remains unclear. It is so irritating to find articles here that almost tell you the scientific facts behind the story, but then in the end leaves you without any substatial new knowledge. I have to agree. This lacks any scientific standing. There may be a scientific basis for this idea but it was not enunciated. We are left with an idea rather than a theory. Did the editor go on Christmas vacation today? This is the second of three articles I've read so far with numerous typos and grammatical errors. Also the posters above me make a good point. It's a real shame. I've mulled over ideas like this, but admittedly I was floating about six inches off the ground. As we all know, everything that can be invented has been invented. Any attempt to perfectly explain reality must occur in the same amount of time necessary for reality to exist. Since the universe was created by a monstrous, bearded humaniod in 4004BC, any attempt at explanation must require 6,013 years. It doesn't actually explain the specific dimensions of the golden section (1 to 1.618). His vision example seems to contradict the existence of a single perfect number since different people have differently spaced eyes and the field of vision for predatory vs non-predatory animals varies dramatically in both extents and proportions. it would indicate something wider than a square but it could be 1 to 1.8 or 1 to 1.2 or lots of other ratios. There is a mathematical and physical explanation for the golden ratio and why it comes up so much, but applying it to something as complex as the field of vision is an unlikely stretch. Such an extrapolated generalization would be analogous to claiming that competing bee colonies have hexagonal territories because hexagons offer the most efficient consolidation of space with the least area of contention between hives. I suspect the golden section plays a role in vision not because of the eyes, but because of it's commonality. After the experimental discovery of the golden mean in quantum mechanics there is no room anymore for conventional skepticism. Those who think in conventional terms that golden mean base quantum mechanics is pseudoscience are themselves pseudo scientists. You could say pseudoscience if we are still talking about a theory. On the other hand to deny experimental result confirming the theoretical work of dozens of researchers is pseudo philosophy per se. The golden mean was discovered in relativity by Sigalotti. It is the basis of the first rational explanation of the two slit experiment by the Egyptian Mohamed El Naschie. It underpins high energy physics as discussed by Slovenian Crnjac, Chinese Ji Huan He as well as many of their associates. El Naschie presented the first complete theory of unification based on golden geometry and golden quantum field theory. Golden geometry and topology was developed in Romania by two mathematicians. A recent magnificent book by a noted Soviet scientist Alexei Stakhov bears witness for the reality and theoretical soundness of the golden mean quantum mechanics. There will be always those who confuse rigorousness with a stubborn narrow mindedness. Those who still are able to claim that anything to do with the golden mean is esoteric and pseudo science is incarnation of narrow-mindedness masquerading in the form of stubborn mathematical rigor. It's interesting that the boxes in Bejan's web site do not follow the golden ratio! They are more like 2.5, instead of 1.618.